"The Packers tied for eighth in the NFL with 44 sacks, and a big reason was their defensive line. Led by Clark’s six, the Packers' defensive line accounted for 12.5 sacks in 2018. Inside linebacker Blake Martinez had five sacks, and he said a contributing factor was the attention opponents paid to the defensive line. That might not seem like much on its own (it ranks about middle of the pack in the league), but given the injuries that hit the position, there’s good reason to think that production will increase in 2019. For a team lacking in edge rush, it helps to start from a basis of quality interior pressure "
Of course its all intertwined and as we try to tease out the relative positional values, its worth remembering that these positions don't operate in isolation. Most here have the Packers cutting Perry - and for good reasons. But the Packers are also blessed in having one of the best ankle specialists on the planet working across the street from Lambeau Field. IF the 2018 ankle injury is the key decider, then the Packers have the capability to find out. IF his entire body is just too broken down, then its time to move on and that helps focus the offseason needs. Only issue I'll take with this is that it fails to take into account that there are multiple WRs on the field for each team. I used 40 WRs in my study versus 20 for positions with only one starter. Now, could you say I should use 60 because 11 personnel is pretty much standard now? Yeah, I think so, but it becomes hard to find meaningful veteran salaries at that point. Which I think has its own conclusive merits. I think it certainly can, but it also becomes hard to tell how much of it is based on rookie deals being a higher percentage share of particular roster spots, which is an additional thing I think would be advantageous to look at long-term. Problem with the linebacker number is it likely includes many guys we would consider EDGE players. Maybe the next CBA will update the categories to reflect the current state of affairs. That was one of my biggest knocks. On average, there's 2-3 WRs on a field for any given play. There's only 1 LT on the field. 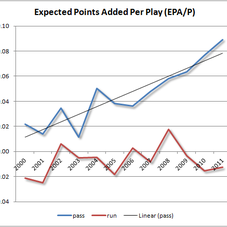 One thing I think we can struggle to properly value is that WR1 reduces WR2 value and then WR3 value. Whereas you can have two great EDGE and they don't take away from each other. I'm not completely sure how to quantify that, but it's something to consider with WRs in particular. 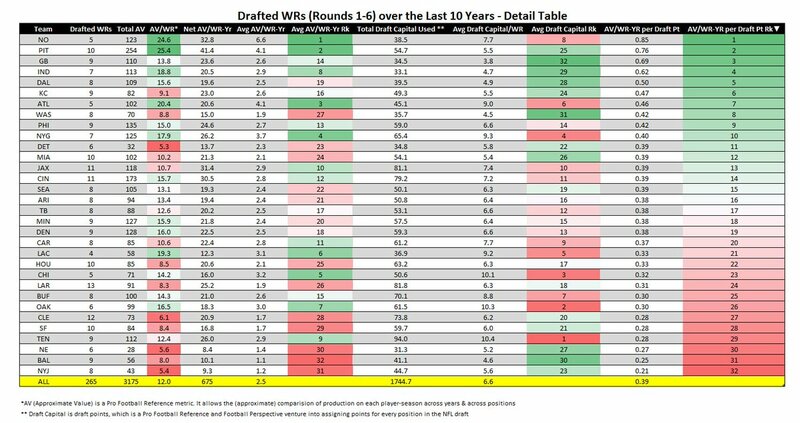 "The Steelers are the best WR-drafting team out of the 28 that drafted more than 5 WRs the last 10 years in rd 1-6. 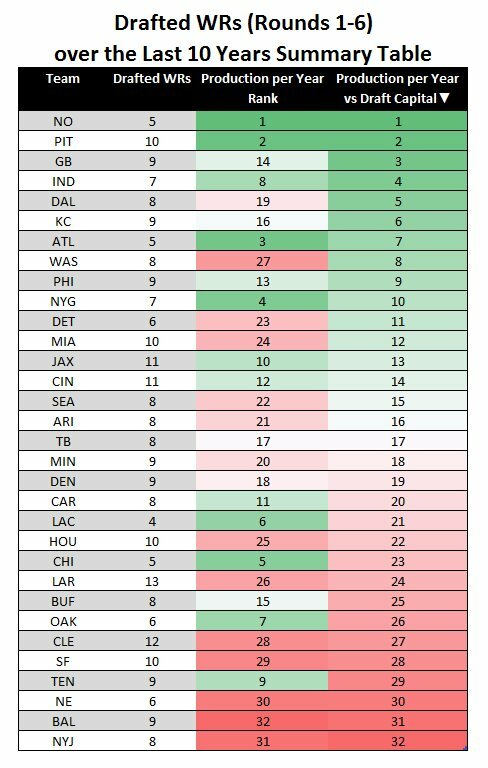 Of the 28, they've received the most production/WR-year & they've received the most value vs draft capital risked. I mean, that kinda goes without saying. But you're talking about trying to compare an elite WR to a non-elite WR. It'd be like comparing an elite LT to a non-elite LT. There should be a drop off in terms of the $$$.